The effects of concentration of gadolinium ions Gd3+ on dipalmitoyl L-α-phosphatidylcholine (DPPC) unilamellar vesicles in aqueous media were studied by photon correlation spectroscopy (PCS) and differential scanning calorimeter. The theoretical predictions of the colloidal stability of liposomes were followed using the Derjaguin–Landau–Verwey–Overbeek (DLVO) theory. Changes in the size of liposomes were observed as Gd3+ concentration increases, suggesting that this cation induces the aggregation of vesicles. 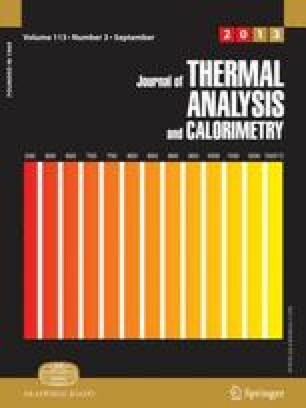 To determine the effect of Gd3+ on the transition temperature (T c) and on the enthalpy (ΔH c) associated with the process differential scanning calorimetry (DSC) has been used. The addition of the metal ion provided DSC curves with different behavior to DPPC bilayer.